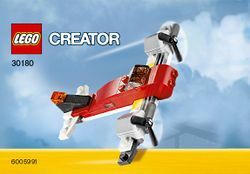 30180 Aircraft is a Creator set released in 2012. It appears to be a mini-scale version of 7292 Propeller Adventures, which was released earlier in 2012. It contains 45 bricks in black, red, white, yellow, light grey, dark grey, trans-orange and trans-brown. This page was last edited on 2 November 2016, at 00:02.